Andy Whitcomb is an outdoor writer who has been featured in such magazines as Oklahoma Today, Farm and Ranch Living, Boating World, and Paddling Buyers Guide. His humor column has appeared in the back of Kayak Angler magazine since 2016. Watch for an article in a 2019 Bassmaster soon. He has received Excellence In Craft Awards by the Outdoor Writers' Association of America in magazine, column, blog, and photography categories. Since 2011, he has been sharing weekly tips, observations, and stories as a multi-species angler and blogger for www.TakeMeFishing.org. "Do You Brake for Splake?" 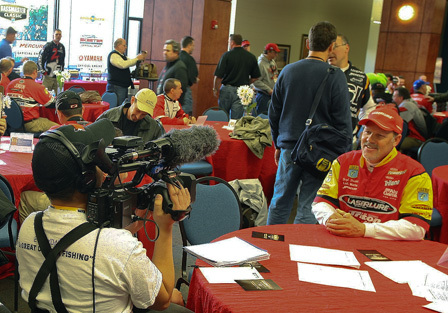 "Just Keep Reeling" A collection of Andy Whitcomb's articles, stories, and columns. "The great thing about Andy Whitcomb is he sees things about fishing we tend to overlook- his "outside of the box" style is what makes him so special as a writer. True breath of fresh air!!!!" "Andy Whitcomb has a clever way of looking at seemingly mundane subjects and giving them an interesting spin. His talents as a storyteller have made him one of my favorite writers. I eagerly anticipate every funny and heart-warming tale." "I think you are probably the best columnist we've had. And definitely the most funny." "Absolutely a new and different point of view and perspective. Your style of writing reminds me a lot of Bill Bryson." 391. "Do You Brake for Splake?" 390. "Fishing Opportunities for the Disabled"
389. "3 Reasons for NE Boating"
388. "Salmon tips for beginners"
387. "4 Species for Fish Farming"
384. "5 Factors That Could Change in New Fishing Regulations"
382. "A One Day Boating License?" 381. "What is needed to get a fishing license"
380. "3 Examples of Fish Restoration in the U.S."
378. "Ice Fishing for Brown Trout"
375. "Toccoa River Fly Fishing"
372. "Wonders of Wildlife Museum"
Recognized as an influential outdoor writer, he was invited to speak on story-telling at 100th meeting of the Association of Fish and Wildlife Agencies. He also presents his perspective of the fishing method evolution, "The Caste System" to universities and schools. "Feel my skills, donkey, donkey, donkey, donkey." With Brandon Palaniuk at 2013 Bassmaster Classic. Opening Day of trout in PA. Released after photo.